Former CIA Director David Petraeus testified at a closed hearing on Friday that the CIA’s original talking points on the Sept. 11 terror attack on Benghazi were edited to play down al Qaeda links to the attackers. The latest revelation of the Obama administration’s mishandling of the terror attack that killed four Americans in Libya was made by Rep. Peter King (R., N.Y.), chairman of the House Homeland Security Committee, who said the disclosures by Petraeus were made during a closed-door House Permanent Select Committee on Intelligence hearing. "He said it went through a long process involving many agencies including the Department of Justice, the State Department, and no one knows yet exactly who came up with the final version of the talking points, other than to say the original talking points that were prepared by the CIA were different from the ones finally put out," King told reporters after a House Intelligence Committee closed-door hearing. Petraeus met for 90 minutes with the House committee before moving to the Senate Select Committee on Intelligence. White House spokesmen did not return emails seeking comment on who changed the talking points. King said Petraeus testified that "from the start" he told lawmakers on Sept. 14—three days after the attack—that "there was significant terrorist involvement" in the attack. "That was not my recollection," King said of Petraeus’ Sept. 14 comments. King said his "clear impression" of Petraeus’ original comments was that the overwhelming evidence was the events in Benghazi "arose out of a spontaneous demonstration." A State Department official told a congressional hearing a week later that it was a terrorist attack. That was the first contradiction in the administration’s false statements, King said. On the Senate side, Senate Intelligence Committee Chairwoman Dianne Feinstein (D., Calif.), speaking to reporters after the Petraeus hearing, defended Rice for using the CIA talking points in television interviews. "And I don't think she should be pilloried for this," said Feinstein. "She did what I would've done or anyone else would've done; that was, going on a weekend show, you would've said, what talking points can I use? And you would get an unclassified version." Feinstein said the hearing did not produce information that contradicted what was said earlier by the CIA or other briefers. The talking points were reviewed and Feinstein, contrary to King, said "not to my knowledge" when asked if changes to the talking points were made by the White House, State Department, or other agencies. However, Vice Chairman of the Senate Intelligence Committee Saxby Chambliss (R., Ga.) said the talking points were changed. "There were some changes made to those talking points to—and, you know, there are still issues about those talking points that are yet to be resolved," Chambliss said. Feinstein opposed Republican plans to defeat Rice based on her usage of faulty talking points. "I don't think that's fair game. I think mistakes get made. You don't pillory a person. And to select Ambassador Rice because she used an unclassified talking point, to say that she is unqualified to be secretary of state, I think, is a mistake," she said. Feinstein then produced the final CIA talking points used by Rice that were earlier made public by CBS. Chambliss said the problem with Rice’s comments was that she did not following the talking points and "went beyond that, and she even mentioned that under the leadership of Barack Obama, we had decimated al-Qaida." "Well, she knew at that point in time that al Qaeda was very likely responsible in part or in whole for the death of Ambassador Stevens," he said. Senate Intelligence committee member Roy Blunt (R., Mo.) 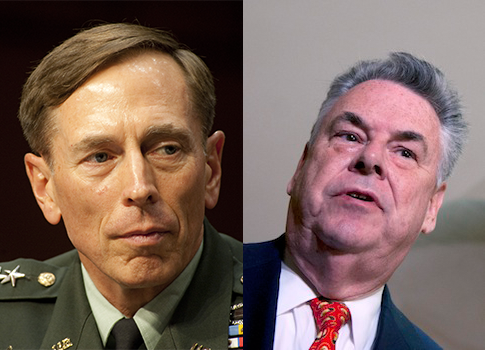 said Petraeus’ testimony Friday highlighted the differing versions of what happened in Benghazi. Petraeus told senators, "There were involvement of terror groups, in all likelihood, in what was happening." Blunt also said he remembered Petraeus saying to Congress shortly after the attack that there was terrorist involvement at Benghazi. Blunt said many questions remain unanswered about Rice and what briefings she received. "I believe she has access to the president's daily brief information," Blunt said on MSNBC. "What did the president know, what did she know? And was she giving information she knew not to be accurate?" The senator said he wants to know whether Rice was merely repeating inaccurate information that was supplied to her in talking points, or if she knew something "that clearly is different than what you're telling the American people." Blunt also said the video of the attack clearly revealed there was no demonstration of any kind prior to the raid by several dozen armed attackers. "We saw the surveillance videotapes yesterday. Everybody agrees there was no demonstration," he said. Rep. Adam Smith (D., Wash.) said after the House hearing that the CIA talking points were not changed to omit references to al Qaeda. "That's just completely wrong," Smith said. "I mean, look, they … there is simply nothing to that. I think that the question is, is the extremist group that we're most focused on, on Libya, is Ansar al- Sharia. There are others. And they are certainly inspired by the same ideology that motivates al Qaida. Whether or not they're directly affiliated with them, it does not appear so at this time, but we're still gathering evidence on that." "The talking points were not changed," he said. Chambliss said Petraeus had a "little bit different perspective" on events in Benghazi and clarified other issues that were "cloudy." He declined to elaborate. A key question for congressional investigators is how did the terrorist group penetrate the compound in Benghazi and who were the terrorists, he said. "We're getting closer to determining that," Chambliss said. "We know they were al Qaeda affiliates or al-Qaeda itself, and we know that there had been training going on on the ground there." The security scandal in Benghazi has called into question pre-election statements by President Barack Obama, Secretary of State Hillary Clinton, and U.S. Ambassador to the United Nations Susan Rice who insisted the attack was a reaction to demonstrations against an anti-Muslim video posted to YouTube. U.S. intelligence officials told the Washington Free Beacon in early October that intelligence of al Qaeda’s growing presence in Libya was covered up by the Obama administration because it contradicted Obama’s statements at the Democratic National Convention that al Qaeda was on the path to defeat. Numerous classified reports also revealed direct Iranian support for jihadists throughout North Africa and the Middle East, as well as increasing al Qaeda penetration into Egypt and Libya in the months before the Sept. 11 terrorist attack on the U.S. compound in Benghazi. The attack killed U.S. Ambassador to Libya Chris Stevens and three other Americans. "The Iranian strategy is two-fold," one official said at the time. "Upping the ante for the Obama administration’s economic sanctions against Iran and perceived cyber operations against Iran’s nuclear weapons program by conducting terror attacks on soft U.S. targets and cyber attacks against U.S. financial interests." The Office of the Director of National Intelligence (ODNI) issued a statement Sept. 28 that said: "In the immediate aftermath, there was information that led us to assess that the attack began spontaneously following protests earlier that day at our embassy in Cairo." "As we learned more about the attack, we revised our initial assessment to reflect new information indicating that it was a deliberate and organized terrorist attack carried out by extremists," the ODNI statement said. "It remains unclear if any group or person exercised overall command and control of the attack, and if extremist group leaders directed their members to participate. However, we do assess that some of those involved were linked to groups affiliated with, or sympathetic to al Qaeda." Intelligence officials said the intelligence on a surge by al Qaeda in the region included information from both technical spying and human agents showing an alarming rise in clandestine al Qaeda activity months before the attack in Benghazi. One official said the handling of Benghazi appeared to be a "disinformation campaign" about the attack that included the information given to Rice for her appearance on five Sunday talk shows when she said the raid was a "spontaneous" response. White House Press Secretary Jay Carney then repeated the false information from the White House pressroom. Then Clinton was provided a partial explanation that the intelligence showed only an al Qaeda surge in nearby Mali. On the Petraeus testimony, King said the former CIA director told the committee that his affair with Paula Broadwell did not have any impact on his testimony about the Benghazi attack. King said the original talking points done by the CIA were "much more specific about al Qaeda involvement." However, the final talking points mentioned "indications of extremism" despite CIA’s original points that there was al Qaeda involvement. The talking points from CIA went through a long vetting process and when the final statement was presented the al Qaeda reference was taken out, he said. King said the House is continuing to investigate the events of Benghazi and whether "anyone at the White House changed the talking points." This entry was posted in National Security and tagged Barack Obama, Benghazi, Congress, David Petraeus, Middle East, Peter King. Bookmark the permalink.